John Force Racing (JFR) announced today that Advance Auto Parts driver COURTNEY FORCE will drive the No. 6 Big Machine Records funny car at the Auto Club NHRA Finals in Pomona, CA this weekend in her final bid for the 2017 Championship. 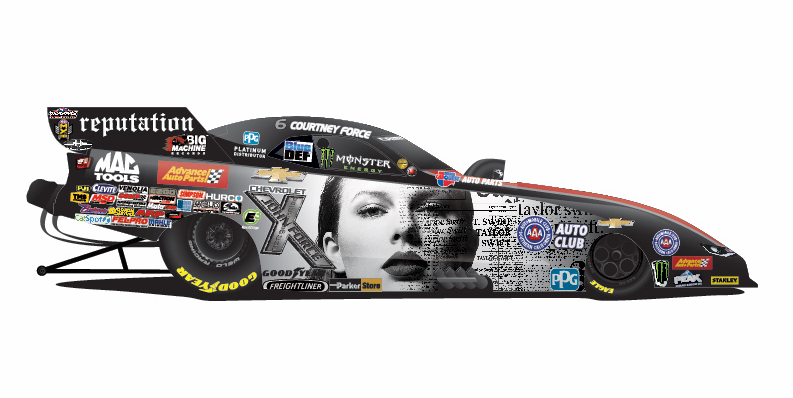 Through JFR’s partnership with the powerhouse record label, the Chevrolet Camaro SS funny car will promote Big Machine Records’ 10-time GRAMMY® winner TAYLOR SWIFT’S highly-anticipated sixth studio album reputation, out Friday (11/10). No one is a bigger champion of Swift and Force than Big Machine Label Group President and CEO Scott Borchetta. “Having Taylor’s reputation album art on Courtney’s car for the NHRA Championship Weekend, which also happens to coincide with the November 10 release, is the perfect match of two game-changers who are truly the best of the best,” said Borchetta. Like her pink breast cancer awareness car, Force had a hand in designing the Taylor Swift car.